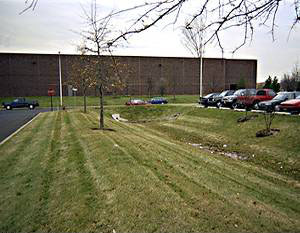 Vegetated swales are shallow, open channels that are designed remove pollutants such as sediment by physically straining and filtering water through vegetation within the channel. As stormwater runoff flows along these channels, it is treated through vegetation slowing the water to allow sedimentation, filtering through a subsoil matrix, and/or infiltration into the underlying soils. 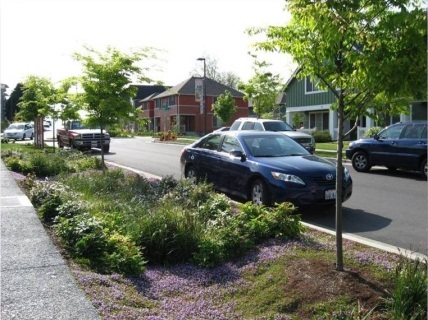 Additionally, swales can serve as conveyance for storm water and can be used in place of traditional curbs and gutters; however, when compared to traditional conveyance systems the primary objective of a vegetated swale is filtration and water quality enhancement rather than conveyance. Some designs also include infiltration through subsurface soil media, or underlying soils to reduce peak runoff volume during storms. Inlet inspection Twice annually Check for sediment accumulation and erosion within the swale. Mowing 2–12 times/year Frequency depends on location and desired aesthetic appeal. Watering 1 time per 2–3 days for first 1–2 months; sporadically after establishment If drought conditions exist, watering after the initial year may be required. Fertilization 1 time initially One time spot fertilization for “first year” vegetation. Remove and replace dead plants 1 time/year Within first year 10 percent of plants may die. Survival rates increase with time. Check dams One prior to the wet season and monthly during the wet season Check for sediment accumulation and erosion around or underneath the dam materials. Miscellaneous upkeep Tasks include trash collection and spot weeding.